Not everyone does; Laura, my theatrical partner, could care less about dessert or sweet snacks. I, on the other hand, search far and wide for a good mocha bar. My wife Kitt is known for evaluations of caramel rolls. Another helping of sugar, please! In Alexandria, I like to stop downtown at Roers Family Bakery. This iconic “doughnut shop” was a feast for the eyes with breads, pastries and desserts galore! Best of all, December’s selection included traditional Norwegian holiday delights: krumkake, rosettes and lefse. Owners Rory and June (pictured) took some time to talk about their business, the support they get from the community and the joy of baking. Alexandria underwent some downtown street construction a couple summers ago, Rory said, but the bakery held its own with a whole new set of customers from the street crew. He also has quite the following during tourism season. 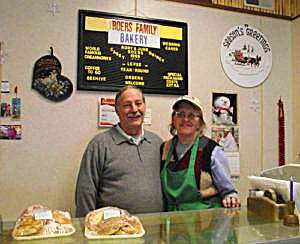 You know you have something special when yearly visitors have Roers Bakery on the “must-do” list upon arrival…AND a stop to “fill-up” on the way home. Lots to find in west central Minnesota for someone who confesses a love of pastries!